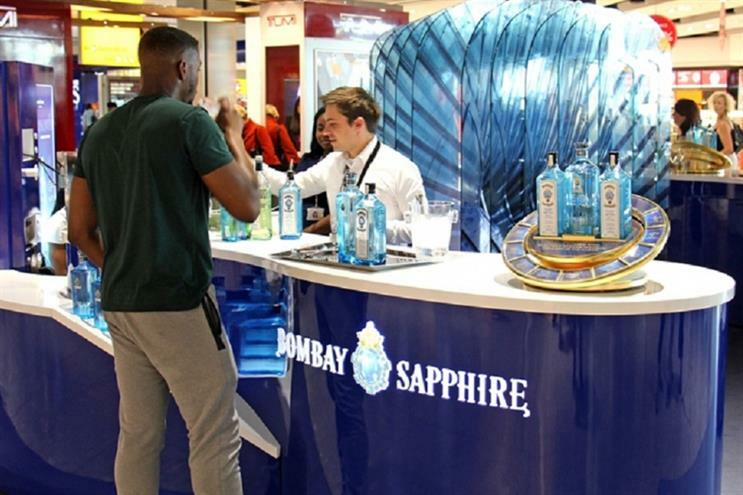 Bacardi gin brand Bombay Sapphire has launched a month-long experiential campaign at Heathrow's Terminal 5. A blue glass installation representing the brand’s glasshouse distillery at Laverstoke Mill in Hampshire was unveiled within the terminal's luxury retail zone over the weekend. Created in collaboration with Bluedog productions, the stand features a bespoke Virtual Reality (VR) tour of the gin distillery and a bar area where a mixologist can prepare gin cocktail tasters for travellers. Over the course of the next four weeks it is hoping to reach 1.5million individuals with an average airport dwell time of 147 minutes, inviting them to experience the brand's heritage and sample the spirit for themselves. Alan Sullivan, managing director, JCDecaux Airport UK, said: "Premium spirit brands advertising in the airport is the perfect example of contextual advertising. The location of our advertising opportunities in such close proximity to World Duty Free allows Heathrow’s discerning passengers to sample the brand in a mind set predisposed to treat themselves. With a 51% AB profile, airports are unique in delivering that highly-sought-after, affluent audience who have a real appetite for premium products, such as Bombay Sapphire." The campaign will run until the 2 of October and was booked through JCDecaux Airport UK by Mediakeys via France. Last month Bombay Sapphire created a rooftop space at the Courthouse Hotel in Soho, London, themed with decor reflecting the brand and serving a range of artisan cocktails. This week it will present a series of lectures by some of London's most enlightened citizens, alongside gin masterclasses at The Proud Archivist and West Reservoir Centre.